Over the years ACM has been privileged to welcome some incredible musicians, all of whom have been there, done that, and got several of the t-shirts. Each visitor has blown our students away with their stories of the industry, their advice and their incredible live performances. Level 42’s Mark King raised the bar, and threw it out the window yesterday when he delivered a scintillating bass masterclass that left students and tutors alike simply gobsmacked. After taking in the sights of ACM, touring the music facilities and dropping into a number of classes, Mark gave an exclusive one-to-one interview with fellow bass player and friend Paul Geary where they talked about Mark’s career highlights, life on the road with Level 42 and his favourite bass guitar. It was then that Mark really illustrated his true class during the two hour masterclass as he talked students through the music business, songwriting, lead vocals, Level42, and how he got started, as well as giving out some incredibly important advice to students wanting a career in music… oh, and demonstrated why he is one of the best bass players on the planet! Mark then took time to meet and greet those lucky ACM tutors and students that had managed to secure a space in the venue. However, although spaces were limited, Mark took time to meet those students who hadn’t managed to secure a ticket. ACM would like to thank Mark for taking time out to visit the Guildford campus and for the words of advice and support he gave to all our students. Watch out for for an exclusive write-up from Paul Geary for Bass Guitar Magazine! See more photos from Mark King’s visit to ACM. 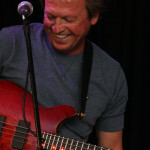 Follow Level 42’s Mark King on Twitter.